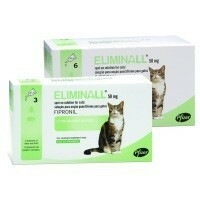 Eliminall Spot-On For Cats is for the treatment and prevention of flea and tick infestations on cats. Developed with Fipronil, the treatment will remain effective for up to 4 weeks against new infestations of fleas, and to ensure this cover remains 100% effective, it is recommended that a new application is applied every 4 weeks. Do NOT use on kittens less than 2 months old and/or weighing less than 1kg.